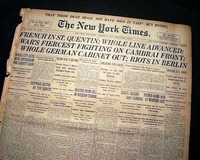 The front page has a banner headline: "FRENCH IN ST. QUENTIN; WHOLE LINE ADVANCED; WAR'S FIERCEST FIGHTING ON CAMBRAI FRONT; WHOLE GERMAN CABINET OUT; RIOTS IN BERLIN" with subheads. 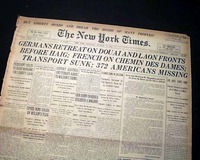 Coverage on the Battle of Cambrai-St. Quentin. 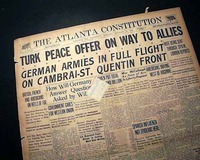 Other World War I reports. 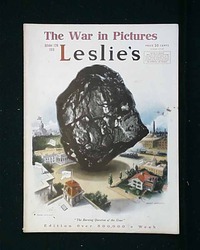 Leslie's Weekly, from New York City, dated October 12, 1918. 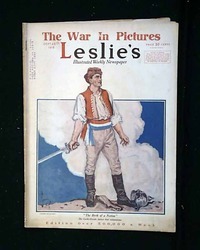 The front page of this issue is an illustration entitled "The Buring Question of the Hour"
This issue includes "Day by Day with the Yankees"; "A King, a Few Generals and Their Guests"; "With the U.S.A. in the Field"; "The Last Crusade Brings Victory" and much more. This 24 page newspaper has a nice banner headline on the front page: "TRANSPORT SUNK; 372 AMERICANS MISSING" with subheads (see photos). 1st report coverage on the sinking of the HMS Otranto during World War I.
Leslie's Weekly, from New York City, dated October 19, 1918. 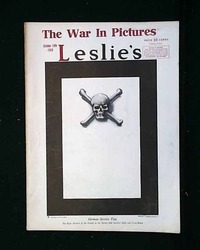 The front page of this issue is an illustration of the German Service Flag. This issue includes "What the Boche leaves Behind"; "Soldiers of Japan Fight in Siberia"; "Nature's Rich Gifts to the Lands Which the Hun Is Losing" and much more. The front page of this issue is an illustration entitled "The Birth of a Nation" - the Czecho-Slovaks declare their independence. This issue includes "An Anxious Moment for One Boch"; "Starting Some 'Yankee Rough Stuff'"; "The New Fellowship" and much more.